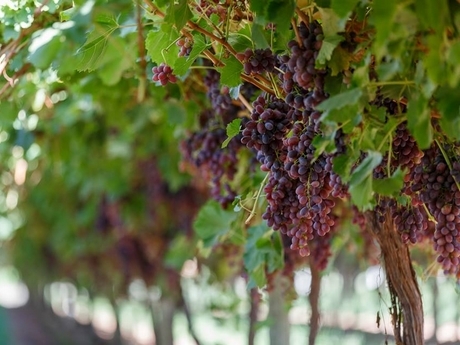 With new table grape varieties coming into play this year, the Australian Table Grape Association says the industry is in for a very exciting season. CEO Jeff Scott says the Sweet Sapphire has been one of the more prominent new grapes in recent years, but others are starting to come into full crop production after growing for 2-3 years. "Ivory Seedless, which is a nice exciting early white variety. That comes in very early and has large berries," he said. "We also have Sweet Globe, which is a mid-season green variety, with nice formed bunches. Pristine is another variety, which are available late March and April. There is also Sunrise Red. It's an early ripening red seedless. Allison Seedless is another March to late April variety. Melody seedless is a black variety which is popular now. But they are commercial varieties, so not every grower has got them. They come with a licence and those growers that do have them, are finding they sell quite well." But Mr Scott adds that the new varieties will take time to develop to their potential in the market, and traditional varieties will remain as the main breadwinner for growers. "It will take one hell of a variety to knock off our Australian Crimson from the top perch," Mr Scott said. "Australia tends to grow Crimson exceptionally well, compared to other regions. We can get the sweetness, we can get the colour, we can get the flavour. So, it will take a long time before Crimson gets knocked off the top perch. The new varieties are there for diversification for the various markets and give growers different options. It all adds to the quality of Australian grapes." It comes as Australian growers now have improved export opportunities throughout China, after their government ratified new protocol conditions for fumigation and cold treatment. Mr Scott says it could be a major advantage, as growers can theoretically have grapes in the Chinese market within five days of harvest. "Potentially that could be very big in terms of going to second-tier markets," he said. "We've been doing some research on that and there are very few fruits going to second tier markets. With the opening up of airlines going to these markets - either direct or just one stop - the potential for Australian grapes to go these cities that have a reach of 50-100 million people." While it is still early in the season, and there is not a lot of data available yet, the ATGA is expecting an increase in volumes on last year. "So far the season is looking good," Mr Scott said "We've been exporting for a while, and growers are happy with returns. The fruit is good quality, so everything is going well. It's a normal year so to speak. Grapes are always a sort after commodity. Domestic demand is always strong. We have some good keen suppliers to the domestic market that supply the major supermarkets here and Australian consumers always look forward to Australian grapes." One of the main reasons for the strong numbers can be put down to the generally good growing conditions. While there has been some heat and isolated storms across Australia, Mr Scott says it has not impacted on yields. "It's been a dry winter, little rainfall, but very cold nights and nice days," he said. "That really brings out the sweetness and the colour and the size of the berries when they come into full production. While we have had some hot spells here, it has had very little impact on the grapes at all. The growers know how to treat the grapes when the hot spell comes - they keep the water up and put the demisters on. The grapes have stood up to it quite well."